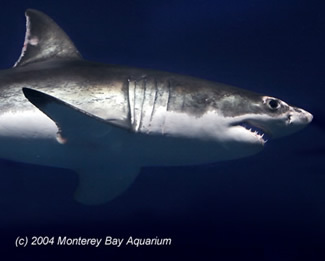 MONTEREY, California -- UnderwaterTimes.com has obtained disturbing photos of the Monterey Bay Aquarium's great white shark that detail shocking damage to the shark’s nose. It is clear from the pictures that the shark's nose has been ground down into a blunt end, with an open wound clearly visible. The damage is likely caused from the shark bumping into the sides of the aquarium. The shark made news earlier in the week when it was reported that it had attacked and killed two other sharks at the aquarium. 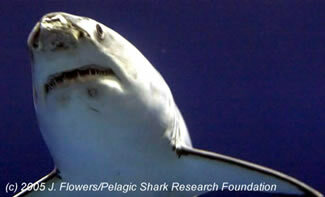 The great white attacked its first victim -- a soupfin shark -- on Feb. 23, biting a two-foot chunk out of its tail. It struck again on March 7 and left a six-inch gouge in another soupfin. Both died. “Fish have been ignored as feelingless things," said Sean Van Sommerman, executive director of the Pelagic Shark Research Foundation, which tags great whites off California's coast. "If you had a zoo display whereby the exhibited animals began to prey upon other exhibited, trapped animals, there would be an ethics question." The attacks were captured on video, but after reviewing the footage, the aquarium's marine biologists are still not certain what prompted the attacks. With the release of these pictures, important questions about the future of the shark at the aquarium should be raised. However, the aquarium does not have immediate plans to release the shark back into the wild. Dr. Randy Kochevar, the aquarium's science communications manager, said it is serving an important role in promoting conservation and demystifying the species. Both Van Sommeran and Phillips noted that attendance, and possibly revenues, have increased at the aquarium since the shark's captivity. Kochevar confirmed that attendance has increased by 30 percent over the past several months. "We believe that the very best thing we can do for sharks in general, for white sharks in particular, in order to ensure their conservation in the wild, is to bring people face to face with them," he said. This is disturbing! I absolutly LOVE Great White Sharks and to see the aquariums blatant disregard for the poor babies well being is absolutly abhorrent! They don't care that the poor thing is injuring itself, that it has attacked other sharks out of apparent frustration and is obviously not going to "tame down" like most species. Things like this make me sick. These "experts" should know better and in my opinion, it's only a matter of time before the poor thing turns on the keepers and/or dies, stressed out and afraid. I feel sick and if I could rescue it I would! As I understand it, the aquarium released the shark several days later. I believe they knew what they were doing and had the best interest of the species in mind. We shouldn't have to keep a shark locked up to promote it's conservation. Some sharks do well in captivity but a great white has never done well. It's unlikely the shark could even be released into the wild if it's sensory organs are damaged. White sharks don't just hunt by sight. My fav. animal has always been the White Shark...Anyone that has a deep knowledge about this animal(marine biologist)should know that you can't take that animal out of it's element..!! Are we reverting back to a society that condones this behavior? 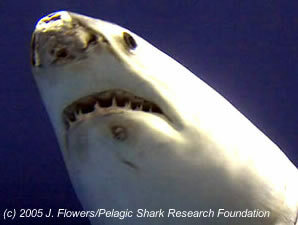 Leave all the great whites alone...They are one of the few species that are left in the ocean unchanged..!! 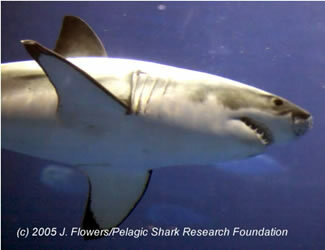 What prompted the great white to attack the two soupfin sharks it shared a tank with? I am not a scientist but I'll take a guess. Frustration. If you want people to come face to face with a shark then educate with experience not a fish tank. People rely far too much on convenience and should make the effort get of their arse and see what life is all about. The moment you take a wild animal out of it's habit to study it, the only thing you will observe is an animal loosing it's mind. Have you ever seen animals pace back and forth in a cage, sounds like the same thing to me. How can you expect an animal to comprehend bars and or glass, for that matter confinement? Experiment on people! ok, i,m no scientist, but if you really cant figure out why the poor animal is causing harm to itself and other sharks then i despise whatever college you went to! its called frustration! you cannot expect to take an animal like a White Shark out of it's natural habitat and expect it to be ok with it! it probably just wants to get out and be where God put it in the first place, the same place that they took it out of! animals have feelings too, and its greatly ignored or just not believed. and having a whole crowd of strange, unknown things (humans)lurking around all the time is probably very confusing and frustrating for the poor thing! I always believed that each animal MUST live in its enviroment... So even more a great white shark that can't really live in a place that is closed and has no access to the wild and beautiful ocean!! !So just live them live their life as we live ours!Sharks are the most nice animals and they shouldn't be treated like that.. I am a marine bio major, and have just gone to see the new shark displayed at the aquarium. He doesn't seem agitated or harmed. I understand the concern of not having it in captivity. But this is the 5th shark the aquarium has had in captivity, and the prior 4 all survived re-introduction to the environment. The biologists at the aquarium know what they are doing, and are always monitoring the health of the shark. The public display of this animal allows hundreds to thousands of people to witness its magnificence daily, helping education the laymen about these wonderful creatures. And the revenue created by the increase of admission helps MBARI (Monterey Bay Aquarium Research Institute) fund their "great white project" which is specifically designed to tag and protect the species as a whole. In my opinion, since the only damage i've seen on any of the sharks MBA has displayed was a minor bump on the nose relative to the many wounds a shark incurs in its natural life span, was well worth the added benefit to the species as a whole. If the individual can be successfully introduced back into its natural habitat without any major problems, then i am supportive of the Aquarium's decision to keep it on display!! Why do this to such a fantastic fish, i don't have major's or anyother degree marine bio i have none but i have been facanated by the great white for about 21 years now i was ten when i feel in love with the greatest predotory fish in there seas let them be. We should study them and not hunt them for shark-fin soup or for something to do on a week or weekend trip. We hardly see them now in there habitat. let mother do her work and not man that is all i have to say. I have to say that I agree completely with Jordan Hardy on this, and he's apparently done his research not just on the subject but also being a marine bio. major and his personal knowledge of the Aquarium. With all that said, I hope that we can continue to learn more from the great whites in and out of their habitats, most importantly that we continue to teach others that they are not 'man-eaters' in normal circumstances. I have to say that i do not agree with keeping this Large Great White in an aqaurium such as Monterey Bay Aquarium. Why so we can study there habits? Thats not going to work as we can see and have learned in doing this several times before. Leave the Great Whites Out in there Normal Habitat and Study them from there only. Its Disgusts me to look at these Pictures of his snout all torn up from hitting the sides of the Aquarium. Why is he in there to begin with? Money of course to increse the numbers of Visitors to the Monterey Bay Aquarium. On one hand, the individual shark (all captive animals really) would be better off in their natural environment than in a cage. On the other, if most people's experience of a white shark is watching "Jaws" there is no hope for the future of the species. I swim open ocean for exercise and I routinely see sharks - aside from one time when I accidentally ran broadside into one, they've never been anything but respectful. There is a need to teach people that there are no "bad" animals - just bad people - and that all creatures play a role in their respective ecosystems. Honestly, given the human population explosion and rampant greed, there is little hope for world's oceans anyway but I see the reasoning for keeping one shark in temporary captivity. Now if we could just do something about commercial fisherman and "bycatch".